Throughout history there are many examples of foreign units serving in the army of a country, but by the 20th century this was rare. One such example that did persist is the Gurkhas, who were tough and popular soldiers from Nepal that served the British loyally. They saw action in several theatres of World War II, but to date this is the only set of these men available. As one of the later Airfix sets, this is a fine piece of sculpting with a good array of poses. Most of the poses are familiar World War II favourites, though the man apparently in combat with his Kukri knife is different but appropriate for the subject. In fact the designer was very keen for there to be many poses holding the kukri, despite the relatively few opportunities in a 20th century war for this or any knife, so poses like the kneeling man in the top row seem more about this than about realism. The most distinctive feature of these men's uniform is the hat, the traditional Gurkha style, which has been nicely sculpted. Although in battle some Gurkhas would have worn a normal British steel helmet, this hat doubtless also saw action. Conveniently for the sculptor, the man lying down firing is wearing a 'cap, comforter'. All the men except the officer are wearing a tunic, an item more suited to World War I or parade dress, but not seen when in action as normal British battledress or the jungle equivalent of one sort or another was always worn. Shorts were worn, particularly in the Far East, though often not during the day in parts plagued by mosquitoes, and indeed shorts were actively discouraged as they left the legs open to all manner of bites, stings and other jungle hazards. In addition we would have liked to have seen at least some as 'Bombay bloomers', but none here are sculpted like this. The equipment is standard British kit apart from the Gurkha knife, the kukri (although many British also obtained this knife). Several of the men have this in their hand, and it has been fairly well done, though the angle in the blade is exaggerated on some figures. This fearsome weapon was carried on the right hip, but many figures here have it round the back or on the left hip, presumably to make sculpting easier. Most of the men are armed with rifles, though one has a sten gun and another fires a Bren gun from the hip. As we have said the sheer number of men with their kukri in their hand seems excessive given the nature of fighting at this time, though the knife had very many uses apart from inflicting harm on the enemy. This is a very nice looking set, with good clear detail and no flash to speak of. However we could not understand why the men were given a tunic since it is historically incorrect and only serves to make them look much too smart. In Europe and the Mediterranean they wore ordinary battledress, and in the East they wore standard jungle uniform. 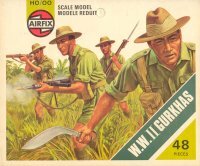 Those that are concerned about accuracy could add the heads of these figures to other British infantry to make perfectly good Gurkhas, but it is a pity that Airfix caused this to be necessary at all.